The Division 2 is gearing up for its biggest free addition yet with Invasion - Battle for D.C., a three-part story that starts tomorrow, April 5. The new Tidal Basin Stronghold is the centerpiece of the incoming Title Update 2, but there's plenty more to dig into, including the addition of Heroic difficulty and a new Gear Score cap of 500. 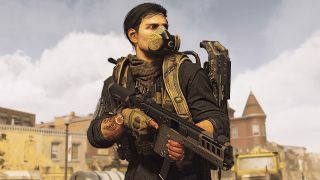 Later this month, we'll get the chance to take on The Division 2's first raid, Operation Dark Hours, so you can bet that there'll be plenty of preparations to make. These are all the big highlights in the Tidal Basin update, and we'll be sure to add the complete patch notes when they're posted on The Division 2's official forums. As the first Stronghold kicking off World Tier 5, Tidal Basin will be the toughest endgame challenge yet, as you fight your way across a Black Tusk outpost sitting on the water. This outdoor dungeon looks like it'll require tight coordination with your squad - and if you need to gear up for it, you should look for missions on the newly added Heroic difficulty, which doesn't have exclusive loot drops but will give better drops on average. You'll need to conquer the Tidal Basin in order to access three new gear sets - Hard Wired, Ongoing Directive, and True Patriot - with set bonuses that reward different playstyles. Though the Tidal Basin update does add a new PvP map called Fort McNair, PvP balancing is scheduled for a later patch, as Title Update 2 focused on rebalancing PvE. Chief among those balance changes is a suite of adjustments to Skill Mods and Weapon Mods, in an effort to promote more build diversity. Skill Mods have been tweaked to line up with the Skill Power needed to unlock them, while most Weapon Mods are getting toned down but won't have drawbacks to counteract their benefits. The only way a Weapon Mod will have a negative effect is if it's offering a substantial positive compared to other mods available for that slot. From April 5 (as soon as the patch goes live) until May 2, The Division 2 will be hosting its first ever Apparel Event, with unique weapon skins and masks available in special event caches. You can get one of these caches for free simply by logging in before April 11, and Year 1 Pass holders will get three more as an added bonus. If you're all about making a fashion statement with your operative, these cosmetics will make you the envy of your fellow squadmates, so be sure to collect them while you can. Rifles: Damage on the MK17 rifle reduced by 14%, also corrected this weapon not having a damage falloff over distance. LW M4 damage increased by 5%, RPM increased from 240 to 360. LVOA-C RPM increased from 240 to 380. Marksman Rifles: Model 700 damage reduced by 13%. Shotguns: AA12 damage increased by 16%. LMGs: MG5 damage increased by 12% and fixed reversed falloff, causing the weapon to do more damage over a longer range. Reduced the amount of Critical Damage and Headshot Damage that can roll on Gear, including the amount on existing Gear. The actual values will differ depending on the level and quality of the gear it occurs on. A closer equivalence between required skill power and the bonuses granted. Changed the amount of skill power on gear to not increase exponentially with level, but instead more linearly. This results in most skill power values on gear being lower, but in accordance with the lowered requirements. Players will see both the bonuses and the requirements of almost all skill mods change as a result of this overhaul. In end game, both Superior and High-End skill mods exist to cover the different needs of different builds. They can overlap in power, but High-End mods have a higher maximum roll potential. Revamped the Sniper Turret version of the turret skill. It now will automatically target the hostile nearest to the players’ center-of-screen (the same method it uses to pick other turret targets) and will fire at that target when the button is pressed, without a lock-on order needed. If a player aims at a hostile, the sniper turret will attempt to match their aim, allowing precision shots using the sniper turret. An issue where the sniper turret wasn’t correctly getting bonus damage when hitting headshots has been fixed. Revamped the Chem launcher skill platform. Pressing the skill button will now equip the chem launcher similar to swapping to a weapon. The player can aim and shoot with normal weapon controls, as well as run with the skill and blindfire it. Quick deploy at the agents own position is still available for the repair version of the chem launcher, using the same controls as before. Unequipping the Chem launcher can be done using the skill button, the B (XBOX) / Circle (PS4) button or just using the weapon swap controls. Staff in the Base of Operation will now shout at the player less frequently than before. World Bank – Invaded – Server Room: ​Increased the time which the Black Tusks needs to complete the download in the Server Room from 200 seconds to 250 seconds. DCD Headquarters: Mission level has been changed from 17 to 18. Roosevelt Island – Invaded – Quarantine Docks: Reduced the difficulty of the first wave of enemies encountered in the last beat of the mission by lowering the amount of Elite and Veteran enemies. Enemies in this part of the mission can only use mounted weapons if there are 2 players or more. This should make it less punishing for solo-players attempting this mission. Removed death of civilian squad as a failure condition for Control Point takeover. The Officer will now remain in downed state until players complete the takeover or wipe. Added a "Friends & Clan" option for Call for Backup that only shows calls from friends and clan members. Added a "Do Not Disturb" group privacy option that blocks all incoming invites.